Companion planting is growing two (or more) plants near each other so that they help each other in collecting nutrients, improve managing pests, enhanced pollination, and higher vegetable yields. Groups of plants which grow well together are called “companions.” The best part of companion planting is that it is organic or natures way of controlling pests and improve pollination. And we all know the benefits of going organic. 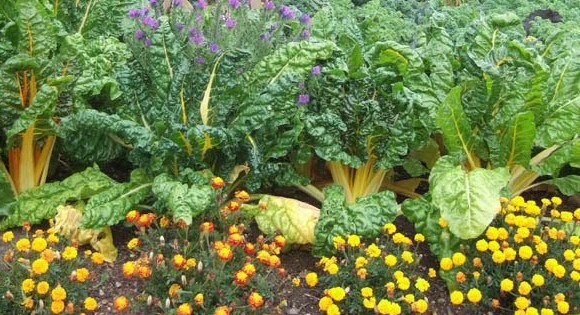 This article is about the basic of companion planting and how to apply it in your garden. Companion gardening is among the many folklore and wives tales, that scientific research results support. From ancient times and before the introduction of mass scale pesticides and fertilizer, people used the concepts of companions in gardening. They believed a certain combination of plants has mysterious power to help each other. Now science also proved that some combinations indeed help to grow the plants very well. Today we call this companion planting or Inter-cropping. Plants, like people, tend to influence one another. Some get along better together than others. Plants relationships with other plant take several forms. They may improve the health or flavor of a companion. They may interfere with the growth of a neighbor. They may repel or trap an undesirable critter. Companion plant may also attract beneficial insects. It helps both the plants to grow. Tall plants provide shade to the sun sensitive shorter plants. You can use your space more productively. It also increases the chances of getting a good yield, even if one crop fails. This provides pest control in an organic way. Some companion plants help in preventing pest insects and pathogenic fungi. It can also divert pests from the other plant. It attracts pollination by attracting beneficial insects. Companion plants some time produce more nectar than the main plant and thus attract more beneficial insects. Provide a desirable environment for beneficial insects and other arthropods especially those predatory and parasitic species which help to keep pest populations in check. Below are some of the example of using the strength of another plant to benefit your main food crops. Using companion plants as a Trap Crop: Here we use a neighboring plant that is more attractive to pests and serves to distract them from the main crop. e.g Growing Collards as a trap crop for cabbages (main food crop) can help protect cabbage from Diamondback moths. Collard, in this case, will draw the Diamondback Moth away from the cabbage. Using companion plant as Nurse crops: Tall or dense-canopied plants provide a windbreak for many vulnerable plants. Taller grain crop protecting shorter transplanted crop from wind damage. Using companion plants as Biochemical Pest Suppression: some plants exude chemicals from roots or other parts of their body that repel pests and protect neighboring plants. Grow Marigolds in and around vegetable crops. The roots of African and French marigolds produce biochemicals that are toxic to root nematodes, minute worm-like organisms that can kill plants or reduce yields. The best way to use this benefit would be to use marigolds as a cover crop and tilling them into the soil. Read more about Marigold and its effects on nematode population. Using Symbiotic nitrogen fixation method: Legumes can fix atmospheric nitrogen for their own use. So by planting legumes near your main crop, you can transfer the benefits to neighboring plants via a symbiotic relationship with Rhizobium bacteria. One such example would be to Plant Bush Beans with Chinese vegetables. Use the Physical Spatial Interactions: Tall-growing, sun-loving plants may share space with lower growing, shade-tolerant species, resulting in higher total yields from the land. A very common example of this is “3 Sisters” of corn/bean/squash. You can pair plants with different growth habits, environmental preferences (e.g. shade vs. the sun), nutrient requirements, and rates of maturity. 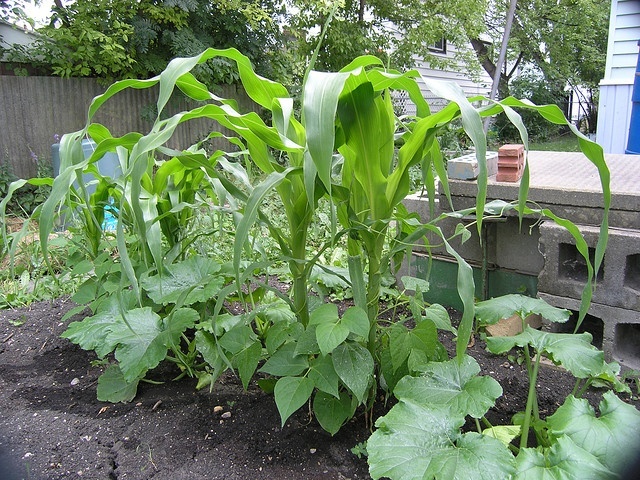 Combining corn, pole beans, and winter squash (also called “the three sisters”) can be a great combination of companion plants especially for a small garden plot. These three plants complement each other perfectly. Cornstalks, provide a living trellis for the beans to climb, and low-growing, large-leaved squash plants provide shade that helps the soil stay moist and suppress weeds. As a bonus, The beans gathers nitrogen to the soil for the next growing season. They are an excellent cover crop. These are also called “inter-cropping” or “inter-planting”. Row intercropping — growing two or more crops at the same time with at least one crop planted in rows. Strip intercropping — growing two or more crops together in strips wide enough to permit separate crop production but close enough for the crops to interact. Mixed intercropping — growing two or more crops together in no distinct row arrangement. Relay intercropping — planting a second crop into a standing crop at a time when the standing crop is at its reproductive stage but before harvesting. Plant beans and corns together. The beans will fix nitrogen in the soil which will also benefit the corn. Whereas the cornstalk would be used as a trellis by the bean plant to climb up. Growing dill and cabbage can be another example of companion planting. Dill can attract many beneficial wasps which can control cabbage worms and other cabbage pests. Basil works well with tomatoes (click here for tomato growing tips). They can improve the flavor and growth of tomatoes. It also repels mosquitoes. Planting garlic near tomato or cabbage plant can help to control beetle and aphids from infecting tomatoes. Cucumber and radish also work together pretty well. Radishes help to deter cucumber beetles. But make sure cucumber is not planted near potatoes as it can encourage the late blight in potatoes. Plants such as buckwheat and clover are excellent choices for attracting bees to adjacent pollinator-requiring crops (with the added benefit of serving as weed-suppressing cover crops). Plants such as basil, cilantro, dill, fennel, and parsley etc., provide shelter and food for many beneficial insects. If you are using beneficial insects such as ladybird beetles, or lacewings, help them complete their life-cycle by growing these plants near your vegetables. Some other useful combinations are radish and carrot, lettuce under tomatoes or eggplant, beets between broccoli, etc. These are just a few of the many such examples. You can find many of them through the Internet. Companion crops help develop a functional garden agro-ecosystem. Choose companion crops to best fit your purpose. While selecting your companion plants just don’t focus solely on the pest management, the proximity of strong herbs may also have on the flavor of your vegetables. Knowing about how fast crops grow can also be advantageous to get the most from your garden space. That is because when the first crop is harvested, the slower growing plants will have room to mature. Place deep rooting plants near more shallow rooting plants so that their roots will be in different soil layers. This will help to absorb the nutrients and moisture they need from differing depths of the soil. Some examples of this are carrots with peas, strawberries with bush beans, and members of the cabbage family with aromatic herbs. Also, pay a close attention to What not to do: Planting some combination of plants can be lethal to both or to your main crop. For example don’t plant beans with onions or garlic, cabbage with tomatoes, and potatoes with vine crops, tomatoes or sunflowers. These combinations can suppress the growth of the plants. Use companion planting, with a greater objective in mind. Don’t just position plants in relation to one another, rather, like in mother nature, maintain diversity in your garden. This will protect the health and productivity of a community of plants. It is also proven in research that with an increment in plant diversity in garden plots, there is a decrease in aphid infestation. So the key point to note here is that If you want to increase your garden productivity, DIVERSIFY! I hope you get an idea about the companion gardening concept through this blog. It is definitely an option you can try out in case you are thinking of going organic. Check my blog the meaning of organic for more information about going organic. Interesting post to read! When we get interest for planting trees, we would be able to enjoy the majesty of our trees for years and years. Thanks för sharing your experiences with us. İm not agree with one öf your couple as companiying plants;Tomatos and pepper. Tomatos and Peppers water requirements are Totally different, contract to first mentioned one pepper loves water. frequently. I am just reasonably certain I’ll learn a great deal of new stuff proper here! I wish to to be grateful for this excellent read!! I certainly loved every little bit of it. information specially the last part 🙂 I maintain such info much. I used to be seeking this certain info to get a long time. Thank you and better of luck. I’m very happy to locate this internet site. I need to to many thanks for your personal time with this particularly wonderful read!! you have book marked to look at new things within your site.